The Atlanta area is becoming a popular spot for active adults. Here are a few of the most affordable 55+ communities. 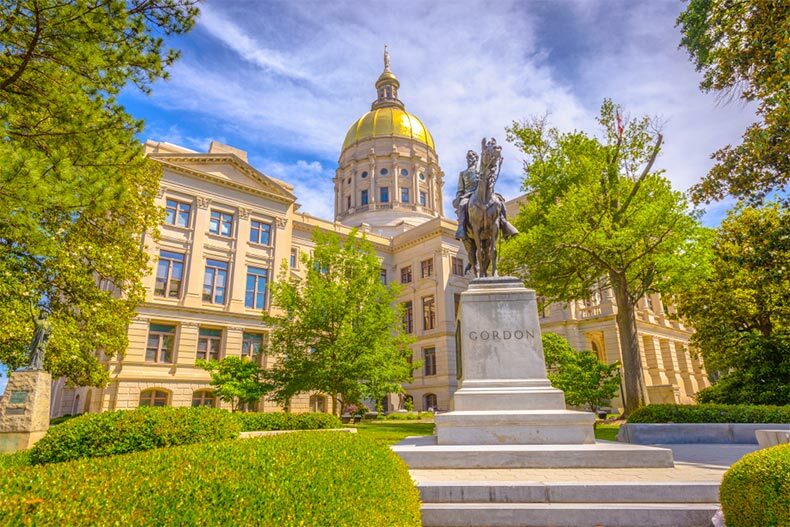 Atlanta is a huge, thriving metropolis filled with seemingly unlimited restaurants, museums, parks, and other entertainment options. But with all of that comes the price of being in the big city, which can get expensive. If you’re thinking about moving to an active adult community in Atlanta and you’re on a budget, you might want to consider looking in the broader Atlanta area. And to help you with your decision, we’ve listed a few recommendations that will fit your budget and your lifestyle. Located about 25 minutes from the Chattahoochee-Oconee National Forests in Blairsville, Lakeside Village rests on the shores of Lake Nottely. Its location is ideal for those who love boating and relaxing by the water. The community features 100 single-family homes available for resale. They range in size from 1,176 to 3,000 square feet with two or three bedrooms, one to three bathrooms, and one or two-car attached garages. Most have expansive outdoor patios, fireplaces, and lots up to an acre. Amenities include a well-equipped clubhouse with a multi-purpose room, a woodworking shop, a pickleball and shuffleboard court, walking and biking trails, and direct access to Lake Nottely. Located just 30 minutes outside of Atlanta in Canton, the Villages at River Pointe has 114 attached homes with two floor-plans, ranging in size from 1,365 to 1,814 square feet. You can choose from two to three bedrooms, two or two-and-a-half bathrooms, and attached one or two-car garages. Both models are open plans and offer first-floor master suites and low-maintenance exteriors with covered patios. Though there is no clubhouse at the Villages at River Pointe, you can enjoy the pleasant climate in a serene and natural environment. Set among the rolling foothills of the Blue Ridge Mountains, you can enjoy the community knowing that exterior home maintenance, lawn care, and common area maintenance are taken care of by the homeowners’ association. Sun City Peachtree is a Del Webb community located 25 miles south of Atlanta in Griffin. This community has more than 3,000 single-family ranch homes available in a variety of floor-plans that range in size from 1,103 to 2,722 square feet. All homes feature one to four bedrooms, one-and-a-half to three bathrooms, and an attached two to two-and-a-half car garage. The largest floor plans offer unfinished basements and loft options with additional bedrooms and bathrooms. Club Peachtree is this community’s modern 45,000-square-foot amenity center. It includes a state-of-the-art fitness center that has the latest high-end cardiovascular and weight-training equipment. The fitness center is surrounded by an indoor walking track, and is adjacent to an aerobics and dance studio as well as an indoor lap pool. There are also a variety of arts and craft studios, a billiards room, card room, library, computer lab, and a ballroom. A large sundeck overlooks an outdoor resort-style pool and spa that features a separate area for lap swimming. Club Peachtree also includes other desirable amenities such as a 146-seat movie theater with a stage. There’s an exciting array of sports courts, including basketball, volleyball, pickleball, and bocce ball courts. The Club Corp Sun City Peachtree Golf Club designed by Gary Stephenson includes an 18-hole, par-72 course featuring elevated tees and generous landing areas. The Orchards of Habersham Grove is located about 45 minutes from Atlanta. This low-maintenance, 55+ community has 88 homes on a resale-only basis. Most homes are arranged in quad formations, but there are a few duplexes in the community. Homebuyers can choose from three floor plans within the Southern Heritage Collection. They offer 2,146 to 2,275 square feet of living space with two or three bedrooms, two or three bathrooms, and an attached two-car garage. An optional second floor offers space for an additional activities room or guests. The Orchards of Habersham Grove offers a quaint clubhouse with great amenities such as an exercise room with cardiovascular and strength-training equipment. Those looking for a more social lifestyle will enjoy the card room or game room that offers a fun space for neighbors to get together. An outdoor pool with sundeck is the perfect place to relax and read a book or take a swim during the hot summer months. The community mini-park is another great outdoor space where neighbors can get some fresh air.